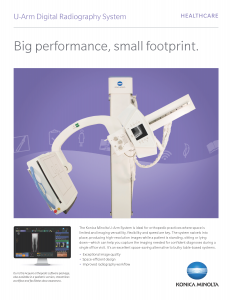 Ultra U-Arm DR | Konica Minolta Healthcare Americas, Inc.
Advanced imaging enables excellent visualization of soft tissue and bones from a single study. Combined with an image display speed of just three seconds post-exposure, your team can see and treat more patients per day, helping to transform your radiography operations from a cost center to a profit center. An optional pediatric imaging package facilitates image capture at a lower radiation dosage for children. U-Arm system components include a main column that is positioned flush with the wall, along with a compact X-ray generator, compact collimator and built-in enclosure that protects the panel during everyday use. This reduced footprint gives clinicians more space to maneuver for capturing images and treating patients. User-friendly controls simplify the operation of dual-speed motorized movements, while an intuitive anti-collision system makes patient positioning fast, easy and safe. The system automatically maintains alignment between the X-ray tube and image receptor at all times, further enhancing throughput. And the included table allows patients to be moved into a variety of positions. To minimize downtime, maximize productivity and mitigate risk over a long functional life, the Konica Minolta Blue Moon Select plan for the U-Arm Digital Radiography System goes beyond typical warranty coverage by including DR panel protection, software updates, onsite service, remote applications, and 24/7 technical assistance. One simple plan. No worries. Sign up at the system point of sale for the lowest five-year cost of ownership.